So I had this really lovely and lyrical book to show you all, and then my kiddo trotted off to the bookstore with Grandma while we were getting our taxes done. 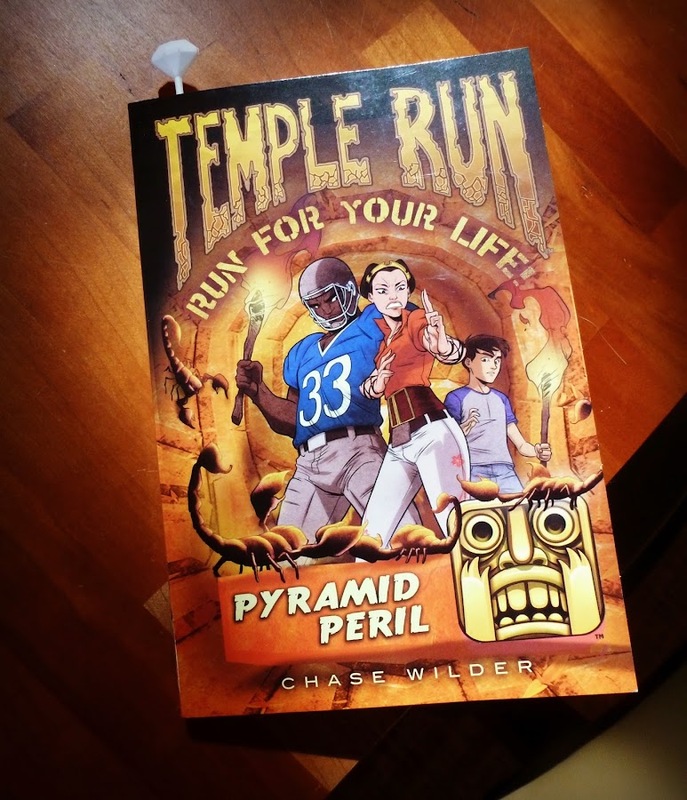 And she came home with 'Temple Run - Pyramid Peril' by Chase Wilder. She was HOPPING with glee. For those of you who might be unaware, Temple Run is a video game that basically involves a character running down paths, roads, cliffs, more roads, more paths and whatnot, trying to evade whatever is in pursuit. 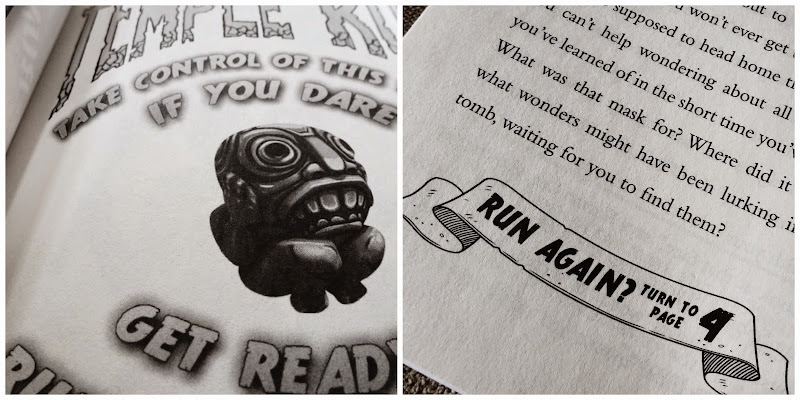 The original game features a mad gorilla (or something), which chases your character. I really don't know much more about the game, except that my child has been obsessed with it for the past two years and plays it on my phone all the time. I'm a very involved parent. Right now she's way into the Temple Run - Oz version. *update - my daughter read this post and said "they're not mad gorillas! they're demon monkeys - black bulky monkeys with monkey skulls for a head." OH I SEE. I asked her what was so great about it and she gave me a very Andrew-esque answer: "I don't know. It's fun." What really slays me are the character names. The game is not so loosely based on 'Raiders of the Lost Ark' (which Julia is begging to see, and I'm like, um......maybe when you're 10??). There's a character named 'Montana Smith', which I think is hilarious. Get it? Indiana Jones? Montana Smith?? OH YEAH. But my personal fave is the character named Guy Dangerous. I laugh every time I hear his name. There's also a dude named Zack Wonder, who always wears a football uniform. So......happy spring?? 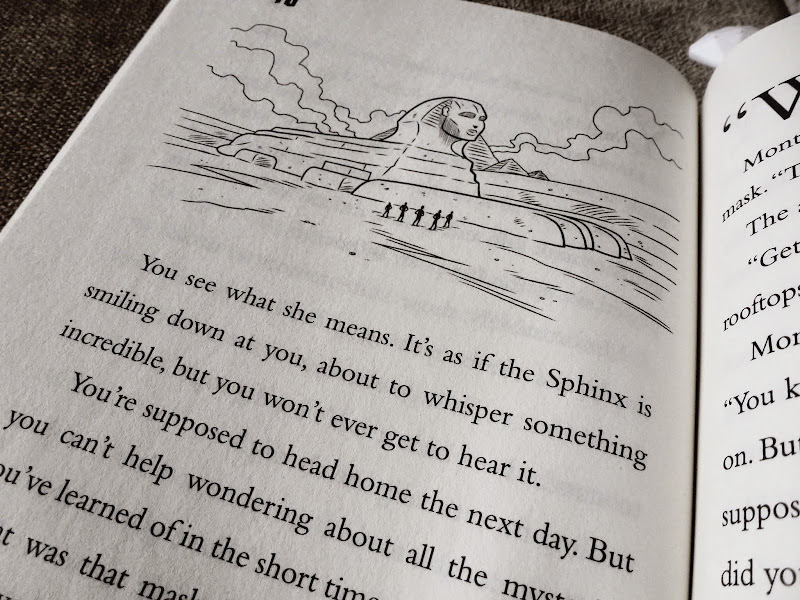 Julia is way into this whole explorer, ancient Egypt mythology vibe right now. Am I missing a movie or show or book that would fit into this theme, other than 'Raiders'? I know I have a book pinned somewhere about some kids who go back in time to Egyptian days. I'll try and find it and put it on this week's Friday Cool Stuff list. In the meantime, watch out for GUY DANGEROUS. Mine have Temple Run 2. In fact, I just got a new phone and when I synced my Google account, I tried to prevent all of their tablet games from downloading. 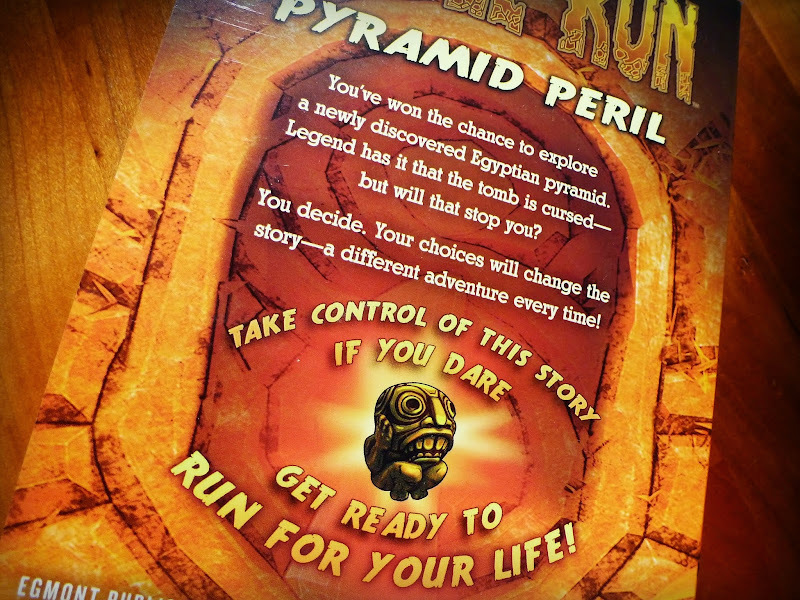 The oldest daughter sneaked Temple Run 2 onto my phone later, though. Cheeky. Rick Riordan has an Egypt series. Have you checked out Egyptology yet? It's pretty cool. I think it's my favorite of the Ology books. Yes yes! Rick Riordan! I was too lazy to put in that link, ha ha ha - Julia is reading 'Red Pyramid' right now! It's the longest book she's ever read. She got it at her school library and I was worried it was too above her level, but she seems to be having a good time with it. We'll go off to our city library to try and find the Egyptology one - she likes the Ology books!!! Thank yoooooo! Okay, the girls and I just heard this on NPR today! That's so cool!! Andrew thinks the creators very intentionally do this type of thing on purpose, (knowing that their audience is mostly female), as a moneymaking device, not as a gender bias perpetuation - but still, this is VERY cool! I have Temple Run on my phone for my son, too. Didn't realize there was more than one- or there was even anything beyond about the first 10 turns or so, as we've never made it that far. You know what's as great a name as Guy Dangerous? The author's name- Chase Wilder. About a chase through the wilds if you will. That's just craziness! Anyhow, I'll look for this and also Rick Riordan- thanks! OH MY STARS yes, that's brilliant - Chase Wilder!!!! You think that's a real name or made up?? Ha ha ha ha! Hi -- I'm CHASE WILDER. Mr. Wilder, wherever you are - your name is AWESOME and RAD. And my kid loves your book! There is a fun series called the Theodosia series by R L LaFevers. Theodosia is a girl whose parents run a museum in London. The plot revolves around Egyptian artifacts and magic. thank you thank you thank you!!!! these look so amazing!!! i want to read them! !